Excited to have provided concept design for the developers of a new, unique and exciting project: The Concours at Carlisle. 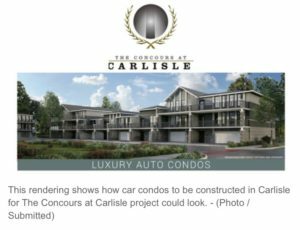 The Concours at Carlisle will feature a 22-unit gated community in Carlisle, Pennsylvania. These luxury condos have been dubbed ‘auto condos’ as they will feature some very unique design concepts. Much thanks to abSketches who assisted with the rendering services! We look forward to seeing this project progress, and will be sure to keep you updated.